2. Payment of taxes for discharge of tax liability as per GSTR-3B: Every registered person furnishing the return in FORM GSTR-3B shall, subject to the provisions of section 49 of the said Act, discharge his liability towards tax, interest, penalty, fees or any other amount payable under the Act by debiting the electronic cash ledger or electronic credit ledger. (ii) “tax payable under the said Act” means the difference between the tax payable for the month of July, 2017 as detailed in the return furnished in FORM GSTR-3B and the amount of input tax credit entitled to for the month of July, 2017 under Chapter V and section 140 of the said Act read with the rules made thereunder. 3. This notification shall come into force with effect from the date of publication in the Official Gazette. 1. GST Council had earlier decided to defer the filing of return in FORM GSTR-3 and had recommended the filing of return in FORM GSTR-3B. Accordingly, the Central Government vide notification No. 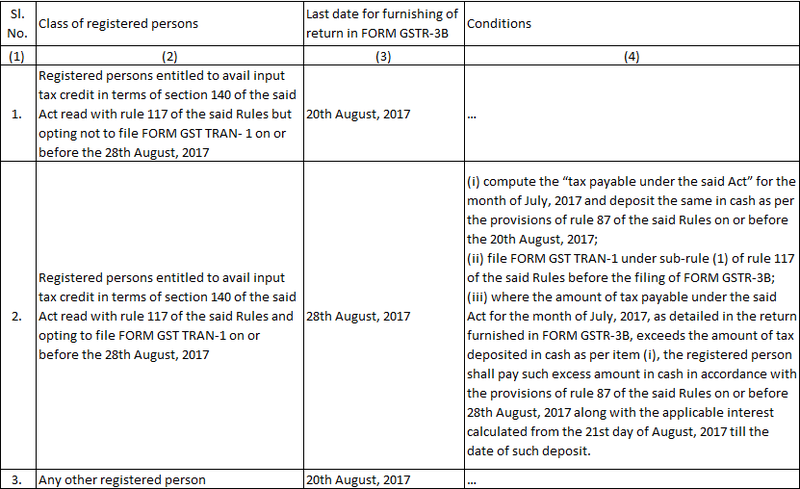 21/2017-Central Tax dated 08.08.2017 had notified the last date for filing of return in FORM GSTR-3B for the month of July, 2017 as 20.08.2017. III. File the return in FORM GSTR-3B on or before 20.08.2017 after discharging the tax liability by debiting the electronic credit or cash ledger. V. File the return in FORM GSTR-3B on or before 28.08.2017 after discharging the tax liability by debiting the electronic credit or cash ledger.